Glance TravelSafely™ is a new smartphone application, developed by Applied Information, that uses cutting edge technology to make the promise of connected vehicles a reality. Harness the power of connected vehicle technology to make your city smarter, and your citizens safer. The Applied Information Glance Smart City Supervisory System™ connects your intersections, school beacons, and emergency vehicles to form a cohesive, connected system. Glance will connect your intersection cabinets so you can remotely control and monitor traffic lights. Our cellular based preemption systems helps emergency responders arrive safe with ground-breaking technology. Remotely update timing plans and diagnose failures with Glance. 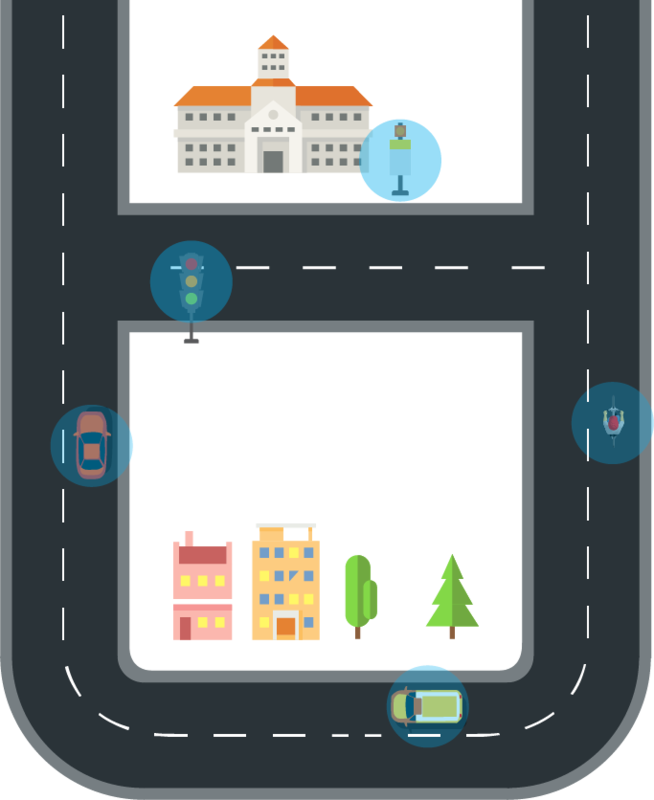 Glance TravelSafely combines Smart City solutions with advances in Connected Vehicle technology to create a network of knowledge that makes your roads safer. The app connects the users phone to a network of traffic intersections, school beacons, motorists, cyclists and pedestrians. Audible warnings are provided to alert motorists of potentially dangerous road conditions. 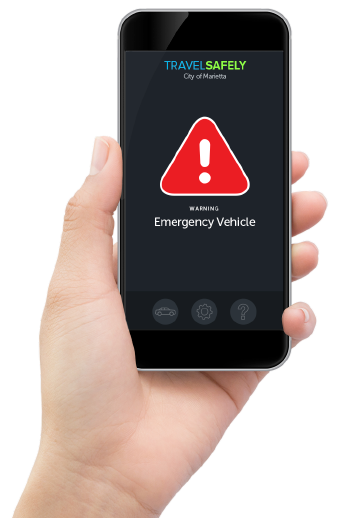 By utilizing spoken alerts, TravelSafely allows the driver to focus on the road and receive alerts while using their favorite mapping app. Where is the emergency vehicle coming from? 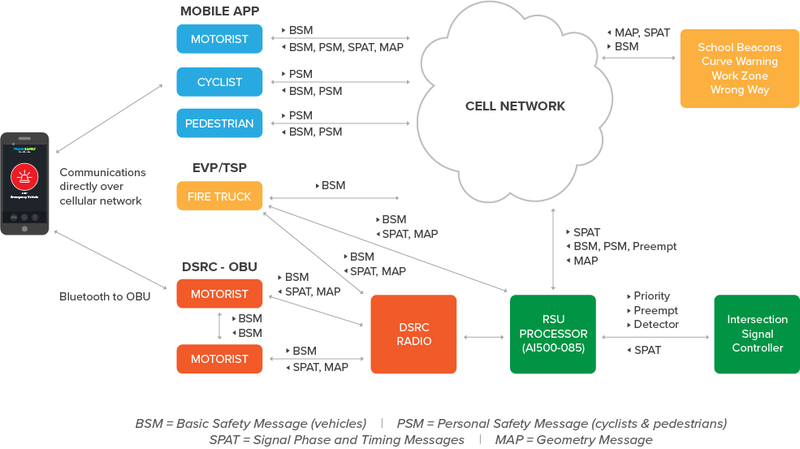 TravelSafely is a new connected vehicle technology that interfaces with traffic signal controllers and sends the information to motorist via Dedicated Short Range Radios (DSRC) and cellular communications. The TravelSafely application works with cellular communications only, DSRC only or both technologies together. The system comprises of an RSU processor (AI-500-085) that interfaces to the traffic signal controller and receives Signal Phase and Timing (SPaT) messages. The RSU processor transmits these messages to the DSRC radios and via the cellular network to the TravelSafely Server. The motorist receives information via the TravelSafely application in their vehicle either directly over the cellular network or connected via bluetooth to the DSRC On-Board-Unit (OBU).